Not a lot to say today, I varnished everything, painted another layer on the eyes. Stuff is looking good. 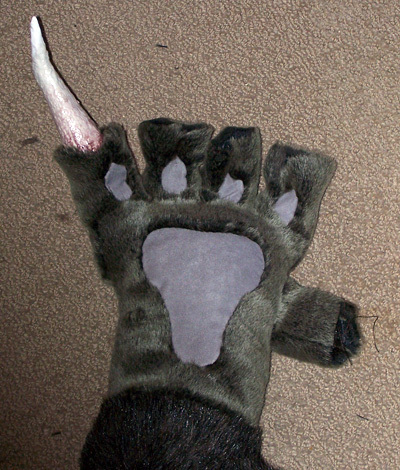 Then I sewed the hands. Well, first at lunch I marked the pieces that needed cutting. Then on the bus I cut them. Then waiting for the next bus I pinned them to the little finger pads. So, after varnishing I sewed the pad to the finger (one side only), then I pinned and sewed the fingers together, then I sewed the rest of the pad and the fingers together. Sounds simple when I write it like that, but it was quite likely the most difficult bit of sewing in the whole project. Turned out spiffy, though. I stuck a nail in just so you guys could see.